Canadians can now make donations towards Hurricane Matthew relief via iTunes, as Apple has opened up donations with its partner the Canadian Red Cross. Donations are available in $5, $10, $25, $50, $100 and $200 increments and amounts will be billed to your credit card, not taken from an iTunes balance. Apple also says since iTunes is not sharing your personal information, individuals looking for a tax receipt may not be able to get one. 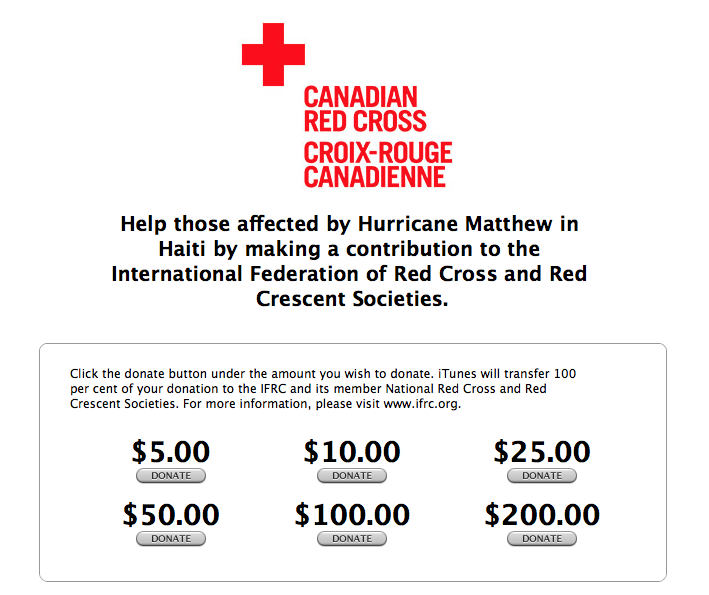 Click here to make a donation to the Canadian Red Cross towards Hurricane Matthew relief efforts.